Product Launch - pOET8! 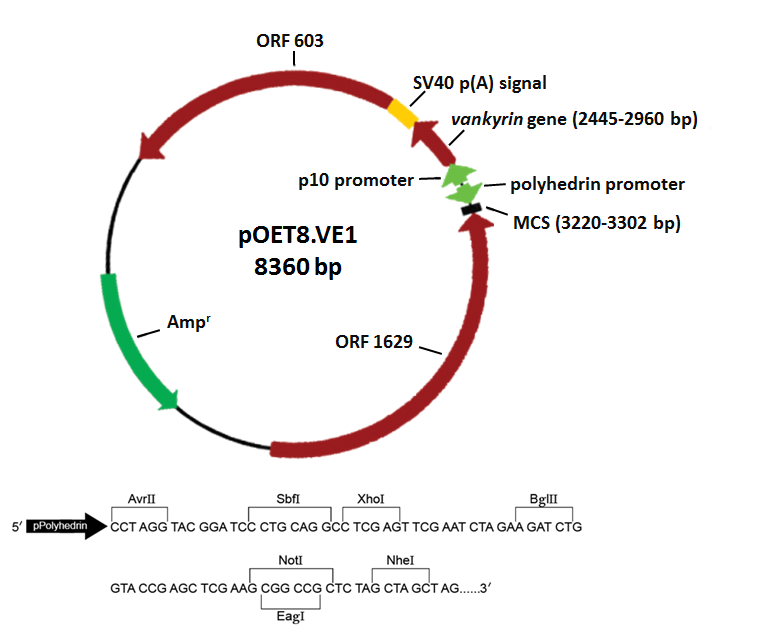 The Newest Baculovirus Vector from OET!Oxford Expression Technologies Product Launch - pOET8! The Newest Baculovirus Vector from OET! November marks the welcome of OET’s newest product – the pOET8 baculovirus transfer vectors (pOET8.VE1; pOET8.VE2; pOET8.VE3). Compatible with any baculovirus expression system, including our own flashBACTM technology, the new range of pOET8 vectors are proven to help increase recombinant protein production in insect cells. The increased yield is achieved by allowing co-expression of foreign genes with a vankyrin expression cassette. This gene cassette comprises the Campoletis sonorensis ichnovirus P-vank-1 protein (Fath-Goodin et al., 2006; Kroemer and Webb, 2006; Steele et al., 2017), an anti-apoptotic protein to help delay cell death following virus infection. Recombinant protein production is further enhanced when these vectors are used in combination with our Super Sf9-insect cells. Full details including vector maps and multiple cloning sequences can be found on the pOET8 product pages along with our existing range of baculovirus transfer vectors. Fath-Goodin A, Kroemer J, Martin S, Reeves K, Webb BA (2006). Polydnavirus genes that enhance the baculovirus expression vector system. Adv Virus Res. 68:75-90. Review. PMID: 16997009. Click here for link. Kroemer JA, Webb BA (2006). Divergences in protein activity and cellular localization within the Campoletis sonorensis Ichnovirus Vankyrin family. J Virol. 80(24): 12219-28. PMID: 1700565. Click here for link. Steele, K.H, Stone, B.J., Franklin, K.M., Dath-Goodin, A., Zhang, X., Jiang, H., Webb, B.A. and Geisler, C. (2017). Improving the baculovirus vector system with vankyrin-enhanced technology. DOI 10.1002/btpr.2516. Click here for link.